The famed Tara Brooch which is on display in The National Museum of Ireland. The Tara Brooch is so much more than a stunning piece of Irish jewellery. Not only is it a fine example of a beautiful Celtic brooch, but it is also by far the most significant piece of Celtic jewellery found to date. To put this particular Celtic brooch into context, it’s helpful to understand a bit about the customs of the time from which it dates. Brooches were part of the customary Celt outfit for both men and women, who used them to keep their cloaks fastened, meaning that they were fairly large in size. Celtic jewellery designs began to become increasingly complex and ornate, incorporating precious metals, between around 700AD and 900AD. The most ornate pieces of Irish jewellery were generally reserved for the more significant figures in Celtic society, and even then they would only be showcased on special occasions. Such brooches are also named-checked in the law books of the time, where the sons of kings are instructed that they must wear a gold and crystal brooch, though less prominent royalty could get away with silver. 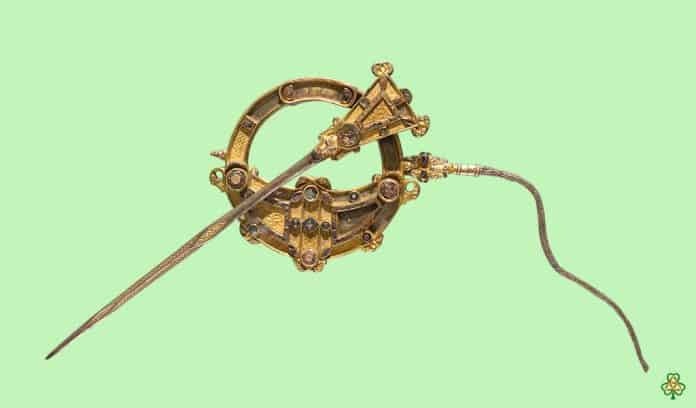 While it can’t be certain who the Tara Brooch was created for, we can be sure that it was for a prominent figure who was wealthy and in all probability male. The name of this most famous of brooches is somewhat misleading. The Hill of Tara was a highly significant location in Ireland in Celtic times, as it was the seat of the High King himself. However, the brooch has no connections to the physical location after which it is named. Indeed, it was found over on the east coast of the country in Bettystown, County Meath, some fifty kilometres north of Dublin. The true circumstances of the discovery of the brooch in the year 1850 are unclear. A peasant woman (or in some versions of the story, her sons) claimed that she found it in a small tin box that had washed up on the shore. There are a number of reasons why this story fails to ring true. Firstly, it seems improbable that a box made from tin would have survived intact over hundreds of years in the shifting sands. Secondly, it seems far more plausible that the brooch was discovered somewhere inland, but that the finder concealed this fact for fear that the landowner would lay claim to it. In any case, the family wasted no time in taking the brooch to a local iron dealer, who was not interested in it. Next they approached a watchmaker who, after cleaning it, ascertained it was crafted from silver and decorated with gold filigree work. He offered the princely sum of 18 pence to the peasant, and this she accepted. He then swiftly offered it Waterhouse Jewellers, who bought it from him for a rather more reasonable sum of twelve pounds. The 1850s saw an enthusiastic revival in Ireland for all things Celtic. The jeweller George Waterhouse had very successfully tapped into this trend, producing Celtic-inspired jewellery to sell to the masses. When he was lucky enough to lay his hands on the brooch, he immediately realised that a valuable marketing opportunity had fallen squarely into his lap, and that renaming it after the Hill of Tara would certainly boost interest in his products. Over the following twenty-two years, the brooch took centre stage in the window display at Waterhouse Jewellers in Dublin, where it became so famous that Queen Victoria herself asked that it be sent to Windsor Caste so that she could see it at close hand. It was one of the highlights of London’s 1851 Great Exhibition, and the next year it was taken to France to be showcased in Paris in the Exposition Universelle. By 1953 it was back being exhibited in Dublin, and later, in 1872, it was procured by the Royal Irish Academy, the precursor to today’s National Museum of Ireland. Moving around so much did inevitably cause some damage to the brooch, and some of its ornate gold panels were lost forever. However, its ethereally elaborate beauty is still very much in evidence. 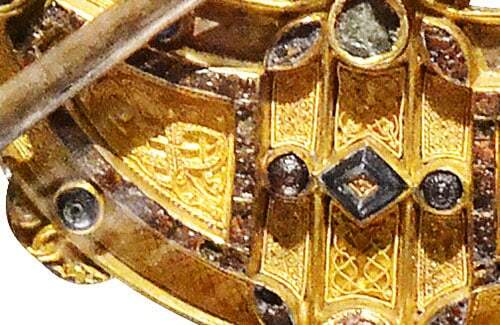 Close up view of a section of the brooch showing the intricacy of the metalwork. It is believed that the Tara Brooch dates to 700AD. It is constructed from silver gilt and has gold filigree embellishments plus other decorative features made of copper, amber and coloured glass, all of which are of the very highest quality. It measures seven inches from end to end and is clearly the work of a highly skilled goldsmith. The particular style of this Celtic brooch is called ‘pseudo-penannular’, meaning simply that while the ring has no opening, it is ostensibly similar to a penannular brooch. It has a delicate silver chain made from plaited wire which is attached by an unusual swivel system. This indicates that it was closed in a different matter to a standard brooch from the period. Before the loss of several of the panels, this piece of Celtic jewellery would have been entirely covered in intricate interlaced designs created by several different processes, including granulation, chip carving, embossing and filigree – another reminder that this is an example of work by an extremely adept and talented craftsman. This piece of Irish jewellery is dissimilar to other brooches from the time in that it is marked with no pagan or Christian symbols. Instead, the design features interlaces, human and animal heads (serpents and dragons feature heavily), geometric shapes and triskeles. This indicates that it was created to symbolise the status and wealth of its owner rather than anything more mystical. Today the Tara Brooch lies in state in the Museum of Ireland alongside some other fine examples of ancient Irish jewellery. The mysterious past of this Celtic brooch, an unparalleled example of Celtic jewellery at its finest, is reflected by the dazzling designs that cover it – the result of hour upon hour of work by an unknown master craftsman.